The books, the extra bits, games, hints, tricks, puzzles... they're all here ! 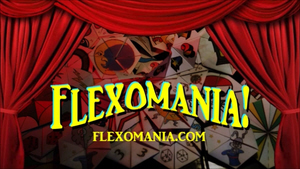 Voted "SITE OF THE WEEK" by AMAZON.co.uk 17/4/01 and since then it's got even better. 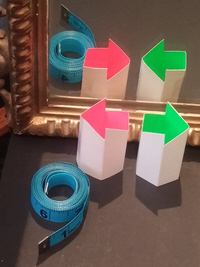 Catriona Shearer's Gorgeous Geometry Puzzles! with video demo and free downloads! How to find the FOCI of an ELLIPSE? Try our DAILY KJARPOSKO PUZZLE! We're the gang from the Murderous Maths books and we hope you enjoy our site. Some of our most popular pages are shown here, otherwise you can find what you want using the link bar at the bottom of the screen or the full contents page. Teachers and homeschoolers might be interested in the guide to the maths in the mm books otherwise try the teacher resources or our A-Z guide. 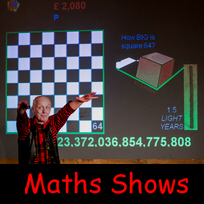 MATHS SHOW You can book the Murderous Maths creator Kjartan Poskitt for shows or appearances or watch him do some tricks on you tube. You might even find some of the hidden links (try clicking on us, or the MM banner above!) 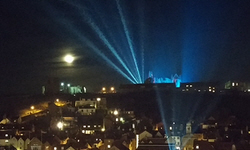 or if you really don't know where to start and you're feeling brave... try the mystery tour! 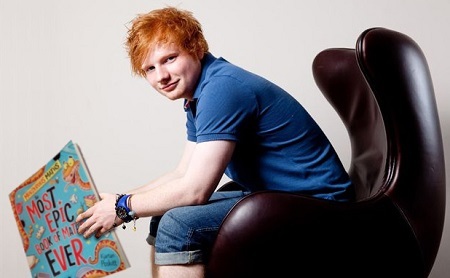 After X and ÷ Ed picks up ideas for his next album! 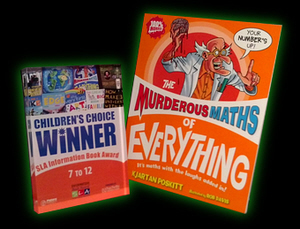 What did the Daily Telegraph say about Kjartan Poskitt and Murderous Maths?